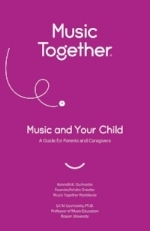 Music Together® Music and Your Child: a guide for parents and caregivers. with music, lyrics, illustrations, and activity suggestion for parents! A Musical Community - each week you'll be having fun with other parents and children who love to play and make music! Every family should have access to beautiful music! If paying for tuition in one sum isn't an option, bartering or payment plans may be available! Tuition for the 10 week session is $200 per child and includes the Music Together professionally recorded CD, downloadable song code to access the online Family Music Zone, Songbook, Growth Chart, and “Music Together® Music and Your Child: a guide for parents and caregivers”. Reduced rate of $120 per sibling of first registered child. Infants under 10 months on the first day of class may attend for free with a registered sibling. There is no need to register your infant - bring them along for the fun! There is absolutely no need to have any prior musical training though Parents and Caregivers are strongly encouraged to participate in class - we all join in the fun together! When your child sees you participating, they will want to join in too! Your excitement and enthusiasm in class is greatly appreciated. After all, you are your child's greatest role model! Once registered for a Session, payment must be made online. Registration will NOT be considered complete unless payment is made upon Registration for class. Payment Plans must be approved by the Center Director and an agreement must be confirmed in writing. If payment hasn't been made by the first day of attendance, registration will be terminated and class materials will not be distributed. No refunds will be given after the first day of the Fall, Winter, Spring or Summer Sessions. No exceptions. There is a $20 Registration Cancellation fee for any registration cancelled within the first 2 weeks of the Session start date. A full refund is available before the Session start date. Once Family Materials have been opened, a rerun for the cost of the materials is not available. A future class credit may be negotiable with permission of the Director. We offer pro-rated for late registrations or offer make up classes for any missed classes due to late registration. Prior approval must be made with the Center Director. Make up classes are made on a drop-in/space available basis. Sorry, no refunds for missed classes. Make up classes may not be carried into other Sessions. We realize that it is very temping to want to document all the fun and musical growth your child may have in every class, but we respectfully ask that you put away your phone and/or camera during class time. There will be an opportunity for a "photo" day during the last class of each 10 week Session for plenty of pictures! Confirmations will be sent by email.